While NASA was working to put a man on the moon, Star Trek dared dream of moving beyond the stars into the far reaches of the galaxy. Though set in the 23rd Century and offering an optimistic outlook for humanity where war, famine and disease were virtually extinct, Star Trek was actually a commentary about the present, each adventure containing allegories of contemporary societal realities; authoritarianism, prejudice, human rights, religion, morality, class warfare and the uses and abuses of technology. With its ethnically diverse cast, it served as a reminder that although our sensibilities can evolve and advance with time, there are always those failings that can rise to prominence if we let them. After all, we’re only human. The U. S. S. Enterprise only completed three seasons of its “five-year mission,” ending its run in 1967. But when Apollo 11 landed on the moon two years later and Neil Armstrong declared Space Race victory with the planting of the Stars and Stripes on the lunar surface, the idea of exploring the galaxy no longer seemed like only a fantasy. A national letter-writing campaign brought Star Trek back in syndication and provided inspiration for many other space-travel themes, including Battlestar Galactica, Space 1999 and Andromeda. With four spin-offs, 13 movies, billions of dollars in merchandising and a new television series set to debut in the fall of 2017, the Star Trek franchise has become one of the most lucrative “enterprises” in entertainment history. After Star Trek’s first season, the Leaf Company hoped to capitalize on the growing sci-fi phenomenon by producing a 72-card compilation that featured action shots of Kirk, Spock and the rest of the Enterprise crew. But the cards mysteriously disappeared from store shelves as fast as they arrived, the most likely explanation being that either Leaf did not acquire the proper licensing or that the cast objected to their likenesses being used without compensation, forcing Leaf to stop production and recall the boxes that had already been distributed. Another theory is that the collection was a test issue that was marketed in a few select cities but didn’t perform well and was discontinued. Though the TV show was futuristic, Leaf’s black and white images on poor card stock were clearly rooted in the past while the heavily-glossed coating made every surface scuff and scratch visible. Each card has a paragraph on the reverse that is intended to describe the shot, though most of them don’t seem to match and many are just hilariously absurd, not actual Star Trek plotlines. 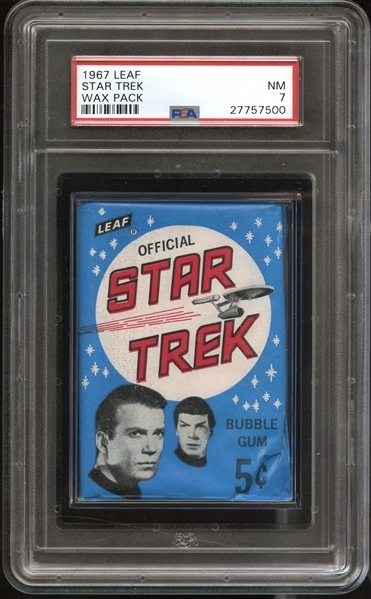 Cards from the 1967 Leaf Star Trek series surface from time to time, but Mile High Card Company is proud to present the one and only unopened five-cent wax pack ever graded by PSA. Recently evaluated and graded PSA 7, it bears the unique distinction of receiving the blessing of Steve Hart and Baseball Card Exchange (BBCE). Mr. Hart explained that he’s seen several Star Trek packs in the past, but all were previously opened packs that had been re-sealed at some point in time. The featured item is the only example he’s ever examined that he can state is undeniably authentic. 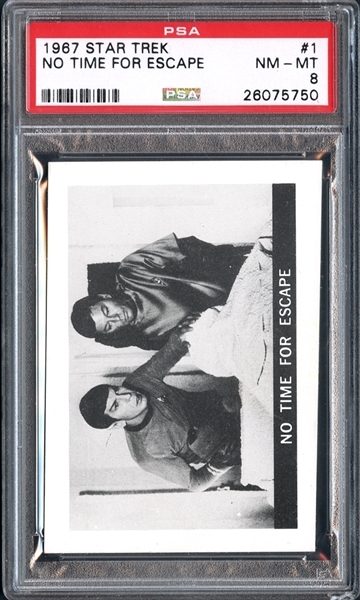 MHCC is also offering the incredibly rare card #1 “No Time For Escape” in the elite grade of PSA 8, one of just 9 to earn such an assessment with just one graded higher. Previous Previous post: 1933 DeLong: Baseball’s Ultimate One-Hit Wonder!